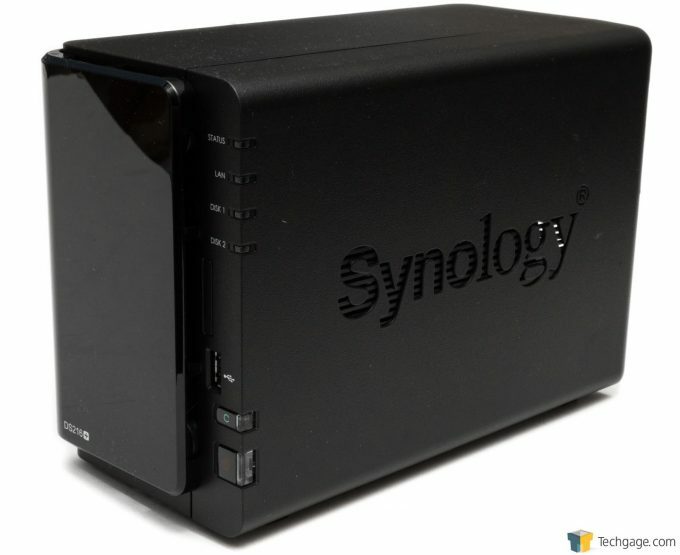 Network Attached Storage is something that all of us want at some point, and Synology has be providing many options for it over the years. Under review today is the DS216+, one of the first generation NAS units to feature Btrfs and Snapshot support with 4K video Transcoding. We take a look at media support, some of the business features, and what’s new with DSM 6.0. Synology is a world leader in network storage, covering a broad range of products; from consumer focused and budget friendly storage units to save backups and important documents, to full-blown multi-rack enterprise storage arrays filled with dozens of hard drives. Today we will be focusing on the former, with a massively feature-rich prosumer and SMB targeted, but budget friendly 2-bay NAS – the DS216+. 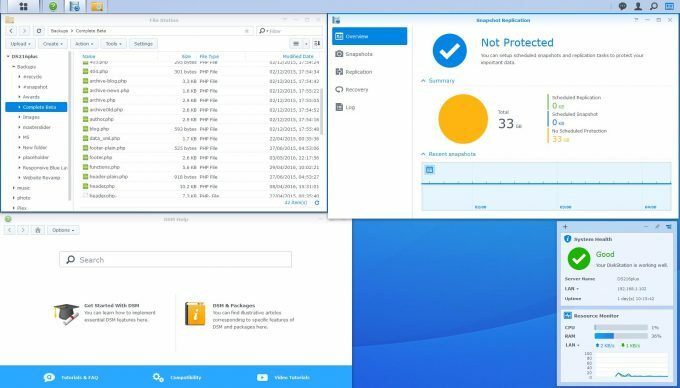 While Synology has been preparing its usual annual refresh of product lines to bring them up to date with the latest hardware, it’s also been updating the operating system that runs on the NASes as well, with a major release update bringing DiskStation Manager to version 6 (DSM 6.0). As such, the DS216+ is one of the first generation NASes to be built for the new OS, bringing with it a wealth of new features. Since there is so much to cover, we’ve opted to split this review up into two parts. Today we’ll be concentrating on the hardware itself, benchmarks, and a focus on the DS216+ specific features. In another part, we’ll be covering DSM 6.0 in more detail, as well as its effect on other NASes. Being a plus (+) series NAS, the DS216+ is host to an x86 processor, which allows it access to the broadest range of features and plugins available on Synology’s NAS units. More specific, it’s an Intel Celeron N3050, dual core, 64-bit CPU running at 1.6-2.16 GHz. The first thing to take away from this, is that it’s not an Atom CPU, but rather a much more meatier Celeron, based on the Braswell SoC platform. While compared to something like a desktop CPU, it’s rather underpowered, but dedicated to a NAS, it’s extremely powerful. Due to this excess of processing overhead and the integration of hardware acceleration, it allows the DS216+ to transcode 4K video down to 1080p for streaming to mobile devices with the included app and plugin. There are some limitations to this setup of course, but be aware that anything 4K related requires a hefty bit of processing power to handle. The bigger brother to the DS216+ is the DS716+ that recently came out as well; this includes a quad-core version of the CPU, 2GB of RAM, and dual NICs (with the ability to hook up to a dedicated expansion system, allowing for an extra 5 bays). Apart from the that, the two NASes are very similar, but with over a $100 price difference. They are both still 2-bay NASes, and both can handle 4K video transcoding. The DS216+ isn’t strictly a business NAS (although targeted as an SMB NAS), so it lacks things like dual-NIC plus failover, has no dedicated expansion units (although it does allow external USB storage), and only has 1GB of RAM to run all available services (more than sufficient for most consumer needs). Since it is x86 based, it can run a number of third-party apps like Plex, but be aware that some hardware features may not be available (the hardware transcoder for example). The two front-loaded toolless bays are where you will load up your available storage, which can be configured for either redundancy with RAID 1, or maximum storage with RAID 0 and JBOD (just a bunch of disks). These arrays can be further configured to be either EXT4, or the brand new Btrfs file systems, which we’ll get into a little later. Up to 8TB hard drives can be used, for a total of 16TB of storage in a non-redundant array. On the front is a single USB 3.0 port for high-speed file transfers for connected external hard drives. This can be configured to automatically backup external storage to the NAS (and vice versa), when external storage is connected, or manually by pressing the Copy button on the front. Around the back are 2 USB 2.0 ports, for Wi-Fi connectivity, printers and other storage options, an eSATA port for additional external storage, and a single gigabit Ethernet port. There is also a single 90mm fan to help keep the unit cool. Total power consumption with 2 hard drives at full pelt is a rather impressive 18 Watts (more for less efficient hard drives), and just 7.5 Watts idle, which is even lower than the DS715. For an x86 based NAS, these are some seriously impressive power figures. While it comes with a 60 Watt power supply, this is to give you some breathing room, as well as provide extra power for USB devices (like a USB 3.0 HDD without external power). Long are the days of a NAS being a simple storage box that’s available on a network. The shear wealth of features available on much of Synology’s NAS range is simply staggering, and almost impossible to cover with any depth. For the most part, we’ll be concentrating on what we would deem some of the more common and applicable features that users are likely to need and test out themselves, as well as the performance impact on a lot of them. The DS216+ was originally released with the DiskStation Manager (DSM) 5.2 operating system, where the Btrfs file system format was initially made available. Since release, DSM 6.0 came out of beta and went mainstream. It’s this new OS version we used with the DS216+, and as such, a number of new features became available. The new OS makes little difference to performance numbers, and is predominantly a feature upgrade for most of Synology’s NASes. Some of the features, like the inclusion of automated Let’s Encrypt certificates, might not mean much to most people, but it helps simplify certificate management, and also happens to be free. MailPlus lets you setup your own cloud-based email server on your NAS. Various document platforms like SpreadSheet means you can keep your documents off Google’s services, while keeping them accessible for everyone on the network. You can setup Virtual and Docker DSM environments, allowing for the DSM environment to be setup then moved to another NAS later, or run on multiple NASes for performance. For a small 2-bay NAS like the DS216+, this isn’t much, but if you decide to upgrade the NAS to a larger unit in the future, you could move the entire environment over, without having to reconfigure all the user accounts, permissions and files. If those kinds of enterprise features aren’t so useful to you, there are a couple of things that will be, even for the average home user. The first is something that many NAS units now include, and that’s personal clouds. Effectively, you can store files on the NAS and make them accessible over the Internet for either other PCs or mobile devices. You get to keep full control over your data, put whatever security you want on, and you only have to contend with your ISP for reliability. Beyond these cloud services, and something new to Synology’s high-end NAS units like the DS216+ and DS716+, is the inclusions of Btrfs, and the associated benefits that come with it. There are a couple of ways to pronounce Btrfs; butter-fs, better-fs, or my personal preference b-tree-fs. It’s a next-generation file-system built from the ground up, with similar features to ZFS. It’s not just about storing data in ever larger formats, with volume sizes greater than the sum-total of all the hard drives on the planet, but integrating additional features that often required an additional software layer to use. While largely beyond the scope of this article, the inclusion of Btrfs on a NAS is big news, and it brings with it a couple very important features that are critical to backups and data integrity. 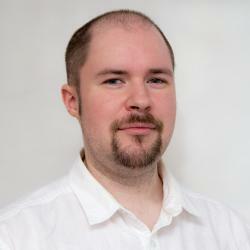 The first thing worth mentioning is that there is pretty much no reason not to use Btrfs. The only time you may want to hold off on its use is if you plan to move your DSM environment, either virtual or docker, to a new NAS that does not support Btrfs. In terms of its features, it brings about two helpful abilities. The first is data integrity checksums. When data is written to the hard drives, it writes with it a parity check and two copies of the meta data; when read and the meta doesn’t match up, it will report the error. This is meant to protect against something on hard drives called “bit-rot”, where single bits of data flip and become corrupt, but otherwise go unnoticed by the hard drive (since the data was read successfully, even though it’s incorrect). Be aware, this does not rebuild the file or data-block (you still need RAID for that), nor will it protect against power outage or software-induced corruption. When used in a RAID array with redundancy, that extra check will cause the array to rebuild that block if there is corruption (as flagged by the checksum). The next big feature is snapshots. If you have ever used backup software with something called incremental backups, then you will likely be comfortable around snapshots. In essence, snapshots work as an instant rollback for files and folders. If you make a mistake, save a file over an existing one, or accidentally delete something you shouldn’t, you can roll back to a previous snapshot of that file or folder. Multiple snapshots can be saved of a particular folder (up to 256 per folder), and these can be created manually or on a timer (day, hour, minute, etc). Snapshots only save the changes, and do not duplicate all the data. If you have a folder of several hundred files, and you only change one or two of them, only those files will be saved in the snapshot (with a time-stamp). We should note that, in order to use snapshots, you need to install the relevant plugin called Snapshot Replication. This allows you create snapshots of shared folders on a schedule, and optionally replicate them to either another volume or compatible NAS (the destination needs to support Btrfs as well). Shared folders can also have snapshots visible to users, so that they can undo any mistakes themselves without an admin. These are even visible on the client OS, such as Windows, and will be visible as an advanced folder.